What to do: Immediately stop using the buffet kits and return them to any Michaels store for a full refund. 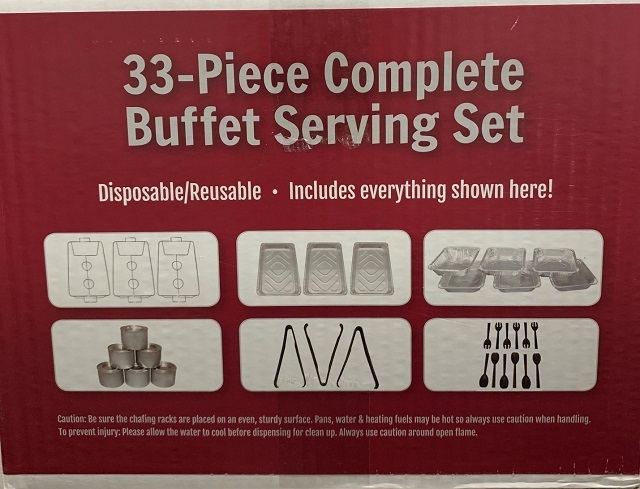 This recall involves the Party Essentials™ brand 33-piece buffet serving set consisting of chafing racks, disposable foil pans, jet fuel cans and plastic servicing pieces. The UPC is 00098382111667 or 00098382111339. The fuel cans do not have the proper consumer chemical labelling required by the Consumer Chemicals and Containers Regulations, 2001 under the Canada Consumer Product Safety Act. This lack of labelling information could result in unintentional exposure of the product to a flame source that could lead to serious burns, injury or death. As of April 8, 2019, the company has received no reports of incidents or injuries in Canada related to the use of the affected product. Approximately 70 units of the affected products were sold in Canada. The affected products were sold from January 2019 to March 2019. Manufactured in China and the USA. Consumers should immediately stop using the recalled buffet kit and return them to any Michaels store for a full refund. For more information, consumers may contact Michaels by telephone at 1-800-642-4235 from 9:00 am to 7:00 pm CT Monday through Friday or visit the firm's website and click on "Product Recalls" at the bottom of the page.